The NM Tax Free Weekend 2018 applies mainly to clothing, school supplies, and computers. Plan ahead and do your family’s back-to-school shopping during the sales tax holiday to save a few extra dollars – or even more if you’re purchasing costly computer equipment. Tax Free Weekend 2018 NM. The 2005 New Mexico Legislature established a deduction (Section 7-9-95 NMSA 1978) from gross receipts for retail sales of tangible personal property within a prescribed period every year in August. When retailers may deduct gross receipts, they have no need to recover tax costs from some customers. Customers can therefore buy these items during this period free of tax. 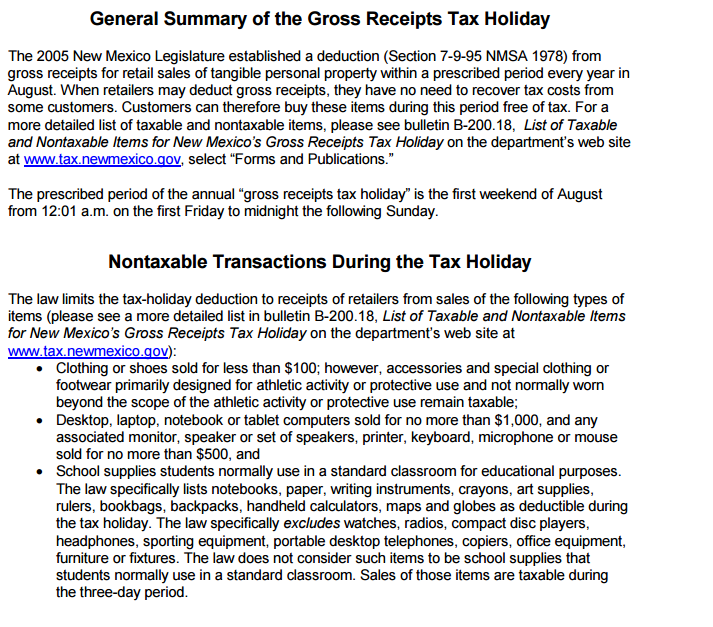 For a more detailed list of taxable and nontaxable items, please see bulletin B-200.18, List of Taxable and Nontaxable Items for New Mexico’s Gross Receipts Tax Holiday on the department’s web site at www.tax.newmexico.gov, select “Forms and Publications.” The prescribed period of the annual “gross receipts tax holiday” is the first weekend of August from 12:01 a.m. on the first Friday to midnight the following Sunday.